Nitrate testing is almost as important as testing for Ammonia. Nitrate is produced during the breakdown of organic waste by the biological filter and the natural biological processes that occur in a living aquarium. Ammonia is more deadly but nitrate is more of a silent killer which weakens a fish's natural immune system and makes the fish susceptible to disease. Even small amounts of nitrate will stress fish. Larger amounts encourage another unwanted pest, algae. Each test kit contains a two-bottle test, API flat-bottom test tube with cap, two laminated color comparison charts and complete instructions including remedies for removing Nitrate. 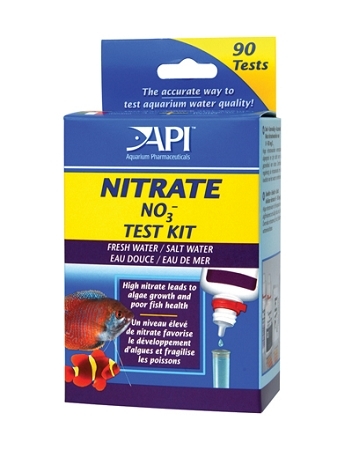 This test can be used in aquarium both fresh and saltwater plus water gardens and ponds. High Nitrates can indicate poor water quality and a build-up fish waste and organic compounds which affect fish health and encourage unwanted algae growth.